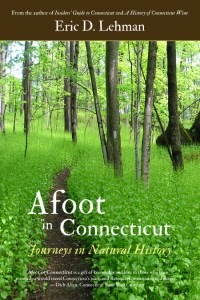 “Connecticut is often the most overlooked of the New England states,” admits Eric D. Lehman in Afoot in Connecticut, his latest homage to the adopted land of P.T. Barnum and Mark Twain. “Other states have higher mountains, grander beaches, more famous cities. Other states in the area have become famous, while we seem to linger in relative obscurity, caught between the city-pinchers of Boston and New York.” But through a decades-long series of more or less successful hikes across the beaches, mountains, and omnipresent country roads of his chosen home, the Pennsylvania transplant discovers a unique spiritual and physical grandeur throbbing amidst seemingly modest surroundings. Equal parts travel writing and autobiography, the book follows Lehman from his first teaching job in the New Haven area and the breakup with his college girlfriend, through years of mostly solitary ramblings, en route to the chance encounter with the woman who will become his wife and beyond, skirting “the faint tracks of the future.” Subscribing to the belief that one must step outside and walk in order to familiarize oneself with a new place, he sets out to cover as much of Connecticut’s surprisingly diverse ecosystems – the Long Island Sound shore, the reclaimed forests of the eastern hills, the tobacco farms and sloping rock formations of the Connecticut River Valley, a short stretch of the Appalachian trail amidst the endless greenery of Litchfield County – and returning, more often than not, with a life-affirming sense of completion, of having been less than a mile from the suburban sprawl and escaping into a beautiful wilderness. And though he goes at great lengths to glorify the nature he encounters – the shadow of a deer and a glimpse of the fawn she’s trying to protect, spooky but breath-catching glacial remains that conjure images of a giant’s fist, firelight on a dune in Indian Summer – he injects less than flattering doses of contemporary reality into the poetry of his heart. Admittedly a professor and a writer before an outdoorsman, Lehman often chooses to eat gas station food, Subway, and Dunkin’ Donuts instead of the more nutritious fare in his pack, finds himself unable to avoid the sidewalks, parking lots and too-manicured lawns that dissect his beloved trails and need for solitude, and succumbs – especially on his first aborted attempt to cross the entire state on foot – to the debilitating foot blisters of the neophyte. While imparting his failures with such candor is refreshing and makes Lehman a very relatable narrator, it also speaks to one of his most salient points, that being able to fully appreciate the natural world is difficult, yet still accessible with a little practice and careful planning, and in the end, that initial difficulty is what makes the journey’s finish line all the more satisfying. Purchase Afoot in Connecticut HERE.